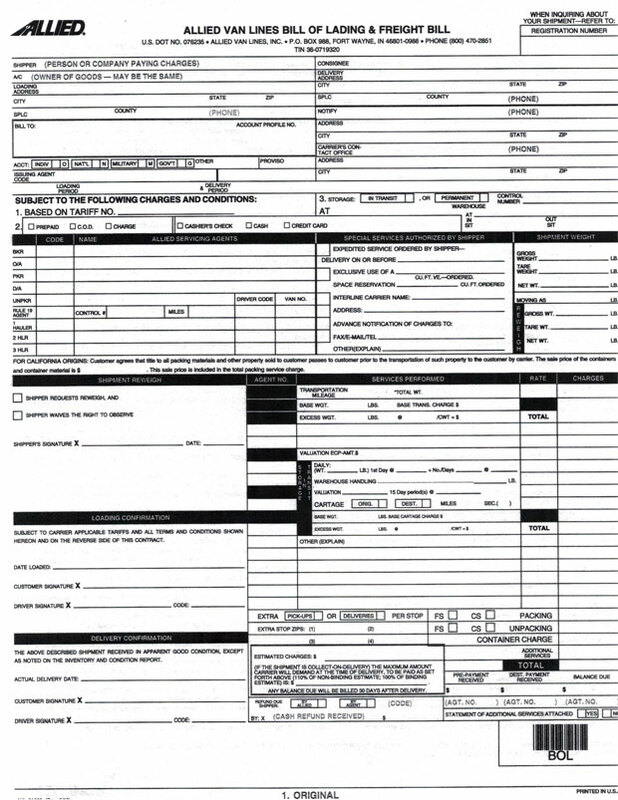 The information on the Bill of Lading is required to be the same information that appears on your Order for Service. Do not sign the Bill of Lading if there is something that you do not agree with. The Bill of Lading states what moving services are to be provided. You must pay the charges that are on the Bill of Lading. Since you will need the Bill of Lading during your move, don’t have it packed in a box and sent with the rest of your belongings. Your mover’s name and address, or the name and address of the motor carrier issuing the bill of lading. The names and addresses of any other motor carriers, when known, who will participate in the transporting of the shipment. The name, address, and telephone number of the office of the motor carrier you must contact in relation to the transporting of the shipment. The form of payment the move will accept at delivery. This needs to be the same that was on the Order for Service. When the shipment moves as a COD, the driver will need your name, address, and phone number so he can call you with the COD charges. For non-guaranteed service, the agreed-upon date for the pickup of the shipment and the agreed upon date or date period for the delivery will be shown on the Bill of Lading. This should agree with the Order for Service. If it does not agree, a proper amendment to the Order for Service needs to be made. For guaranteed service, the dates for pickup and delivery and any penalty or per diem entitlements due you under the agreement need to be itemized. The maximum amount your mover will demand from you, based on the mover’s estimate, at the time of delivery for you to obtain possession of your shipment when your mover transports under a COD basis. The Surface Transportation Board’s required released rates valuation statement, and the charges, if any, for optional valuation coverage. Evidence of any insurance coverage sold to you from an independent insurer, including the amount of the premium for such insurance. Attachments to the Bill of Lading are the binding or non-binding estimate, the order for service, and the inventory. Remember to carry your Bill of Lading, binding or non-binding estimate, the order for service, and your inventory with you during your move. Never sign an incomplete Bill of Lading.